Beaver Island...where the predicted rain held off for the entire day to allow me to play golf this morning, entertain friends for brunch afterward, help Jim get all the outdoor furniture into dry storage in the garage, create a rock stack and take photos, and then have dinner at friends and spend part of the evening on their deck. Rain still expected but now to come after midnight (any minute now). Relaxing...zen...nice. One more day before we head back to Chicago. Super composition of both the stack and the capture! Invokes peace. Your day sounds perfect! I love these little rock stacks, I'm not sure why but they always appeal to me. Nicely processed. Great balancing act! I've seen stacks of stones like this in Hawaii and as trail markers. Sounds like a busy day rather than a zen day. Great rock stack, love the egg shaped one. Great shot. I love the zen stack. Fav. Beautiful image Taffy I love these little balancing acts! I agree with Jane about the crop as the dark part is a little distracting. Sounds like a fun packed day with a perfect ending! Love this image. Sounds like you had the perfect day. Golf, friends, food and photography! Amazing shot. Don't know how you managed to balance it all, but it's so effective! Wow, very clever. Great shot. I would crop out the dark patch at the top of the picture though as it is a bit distracting. What a busy day you have had, glad the rain held off. Very lovely - nice soft look. Gorgeous image. Has a great mysterious feel to it. Fav. What a great day! Enjoy your last bit! Busy day - nice image. Nicely balanced, in every way. 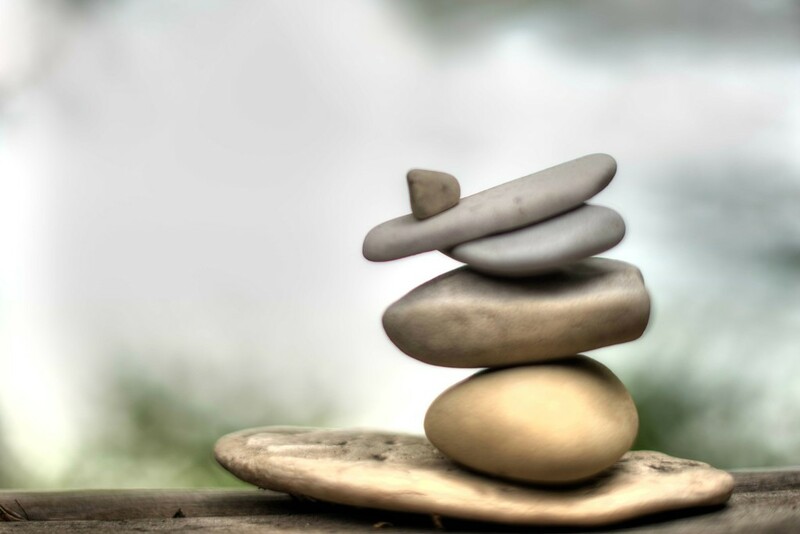 I enjoy a rock stack... they are so calming. Sounds as though you guys had a great day. Fantastic rock balance,. I keep meaning to have a go at this but never get around to it. Lovely shot. The stones seem to glow. Lovely shot! @jgpittenger @onewing @pamknowler Thanks for the advice Jane, Babs, and Pam. I agreed when I looked at it. In the larger version, I was working on this to create a b&w for natural light and bokeh was a big part of it. But for this version, the bokeh not only was trivial, it was distracting. I couldn't crop without ending up with proportions I didn't like, but see if you think this may be an improvement. @jgpittenger @onewing @pamknowler Ignore message above! I realized that I COULD crop it if I went back to the original proportions. I'd been working so hard to keep the now-irritating bokeh that I just realized without it, the crop would work as I'd originally shot it! MANY thanks! I do like this one the best. Lovely definition. I'm sat with the remains of a 4 seasons pizza overlooking the sea in Sicily. Nice pizza, too much wine! beautiful soft light and tones... i'm curious about the processing... low clarity? reduce sharpness? @northy Thanks Mira. Processing was multi-step and I'm not convinced which step brought out the soft tones. Started with HDR using Photomatix, and there brought out details using one slider and reduced the sharp focus in another. Then brought into LR and used the clarity slide to soften further. Also used Luminescent slide a little for reducing noise. Then fiddled with the saturation sliders to get the duller tones which I think also contributed to the soft focus feel to it. Basically, the soft started before the clarity slide and that slide alone, on another image from the same shoot, would not get to this same effect (where I didn't have three to combine in HDR first). @busylady Thanks Judith, and your setting sounds quite wonderful on all counts! I think stacking stones is harder than it looks - or is that just me? Nice restful image and sounds like a perfect end of summer day. Wonderful pic, composition and balance! So pretty! Love the rocks and processing. Sounds like you had a very busy day. Nicely composed shot. @northy I haven't used LR's HDR function as I'm comfortable with Photomatix. The reviews I read didn't make me think it was worth learning since I can use Photomatix within LR as it is. Sounds like you had a busy and productive day! Good shot! gorgeous love the Zen feel, great shot Taffy! I appreciate images of such exquisite quality don't just happen, and I am clueless on processing. However this beautifully balanced stack is an instant Fav, I would blow it up and hang it! This is gorgeous - love the calming mood you've created. I've always wanted to try this, but when I do, I may get two rocks to balance!! LOL No coordination on this girl's part!! Love yours and your POV! FAV! Amazing fav! Soft rocks! Who knew? This is super Taffy. I prefer it to the b&w one. I love the golden tones you have here and the composition. Great shapes in this stack! Beautiful shot! I like how the general feel of this piece is so soft, despite the hardness of the rocks. Balanced zen, indeed. Sounds like you had an absolutely amazing day....they should all be like that! Love this shot.....actually, love the softness, but really debating whether the rocks should be softer or not...I do admire you for all your wonderful processing skills!! So nice to have time for this incredible balancing act! Love this! Congrats on TT! Very...Zen! Well done on TT. fav.